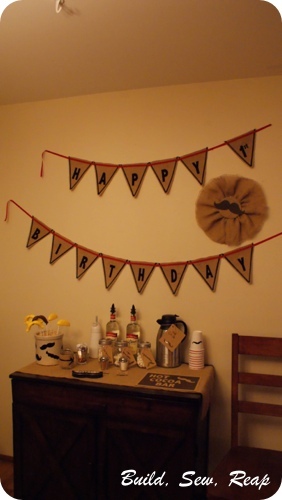 For the baby's first birthday party, we had a mustache theme. Because it was in mid December, we opted for a menu of warm homemade soups and a cocoa bar. 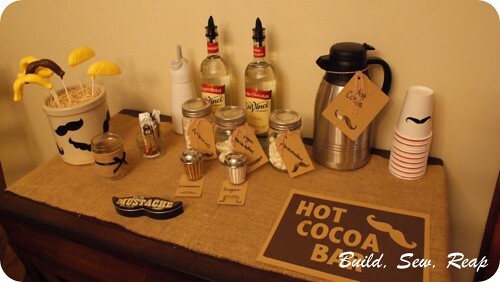 The cocoa bar was so fun to put together and I had all the ingredients on hand. I followed the instructions on the cocoa container which said to mix the sugar (agave), cocoa, salt and 1/3 cup of water in a saucepan. I cooked it over medium heat until it boiled then kept it boiling for at least 2 minutes. Then I poured in the soy milk and heated to a good drinking temperature. The agave made it nice and thick but I found I was able to drink several cups without getting a sugar rush which is a nice thing about agave.